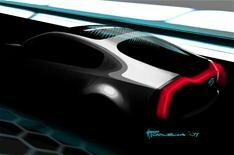 Kia reveals Ray its plug-in hybrid | What Car? This is Kia's Ray concept car a plug-in hybrid that will be revealed in the metal at next month's Chicago motor show. Ray will form the centre-piece of Kia's display at Chicago and shows the direction in which the company's hybrid development will take. Kia claims to have already produced 'potentially' real-world fuel-cell vehicles, and says it has prototypes on trial in the US and Korea. The company is also conducting trials that are collecting data to be used in the manufacture of a commercially viable liquid petroleum gas (LPG) hybrid within 12 months. Kia hasn't released an on-sale date for its hybrid vehicles in the UK, but trials of petrol and diesel hybrid vehicles are expected to start here later this year.